The Reformation challenged the very foundations of religion during the 1500s, opening up new religious opportunities for millions of people who didn’t agree with the reigning Catholic Churches’ views. The Counter-Reformation made by the Catholic Church blocked these ideal’s and tried to regain the followers it had before. The Reformation started in Western Europe during the Renaissance period. In 1517, a man named Martian Luther publicly protested the Catholic Church’s teachings and called for its reform. Later that year, he created the Protestant Church based on his 95 theses. With the use of the printing press, he was able to spread his ideas widely. He also printed bibles in other local languages instead of Latin since Latin was considered a scholarly language only a few people could understand. Luther’s cause got a big boost because of Henry VIII. Henry VIII wanted to divorce his wife, Catherine of Aragon, and the Pope of the Catholic Church said no. Henry VIII then broke from the Catholic Church, founding and becoming head of the Church of England. In Germany, many peasants were inspired by Luther, whose views were shared by the common people. 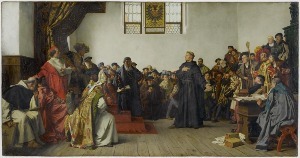 In 1524, the peasants revolted, and Luther sided with the German Princes, ultimately leading to Protestantism becoming the state religion at the end of the Reformation. In Switzerland, the Reformation began in 1519 when a man named Ulrich Zwingli started giving similar sermons to Luther’s. In 1541, after being exiled, another Protestant named John Calvin was invited to Geneva, Switzerland to practice his religion. Many Protestant exiles came to Geneva to listen to Calvin’s sermons, leading to his doctrines gaining popularity in Scotland, France, Transylvania, and the low countries for over 400 years. The Catholic Church responded to Protestantism gaining popularity by addressing the problems that started it. Pope Paul III led the church to become more educated, more literate, and introduced new religious orders. They also emphasized the belief of Christ in the Eucharist, the Virgin Mary, and St. Peter; all things the Protestants attacked. In 1541, the Roman Inquisition began in order to maintain dominance where the Protestant princes had power. The Catholic Church also tried to reconvert areas that were once Catholic, like England and Sweden, but with no success. They also converted Spain and Rome to Catholicism during this time. The Reformation and the Counter-Reformation brought major changes, hope, and despair all over Europe. These acts are a very important part of history that changed the way religion was thought about altogether.